But I will say this: If there had been something like a “wave”, the Dems would have retaken the Senate, too. They certainly were in a position to do so, needing only a net gain of only two seats to go from a 49-51 minority to a 51-49 majority. (I’m counting two so-called independents as Dems because that’s how they vote.) But, instead, the GOP added two seats (assuming that Sen. Hyde-Smith of Mississippi retains hers in next week’s runoff), and will open the 116th Congress with a 53-47 majority. Why the disparity between the House and Senate in this year’s mid-terms? If the mid-terms had been a “referendum” on Trump, as often suggested (even by Trump), the House and Senate would have gone in the same direction. They didn’t because the election wasn’t entirely about Trump. One story is that the Dems gained in the House because of a focus on health care. It is the Dems’ own creation — Obamacare — that has pushed health-care costs and premiums ever higher in recent years. But that matters not to ignorant voters, who are sucked in by promises to “get it right”. Dems are good at making such promises. The Senate results tell a different story. It was possible for Trump to lend visible and vocal support to GOP Senate candidates in a way that he couldn’t for the vastly greater number of GOP House candidates. So, if anything, the “referendum” on Trump occurred in Senate races, and Trump won. This entry was posted in Electoral Politics and tagged Blue Wave, Election 2018. Bookmark the permalink. FiveThirtyEight identifies 23 “pure” GOP retirees from the House, where a “pure” retiree is one who walks away from politics rather than run for another office (https://fivethirtyeight.com/features/here-are-all-the-republicans-retiring-from-congress-in-2018/). Dems took 8 of the 23 seats vacated by “pure” GOP retirees. Arguably, incumbents might have won 7 of the 8 seats, so retirements made a difference, but not a crucial difference. 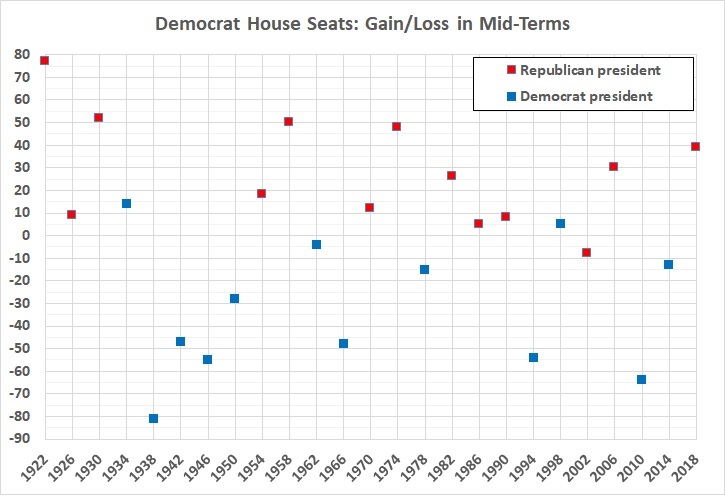 As the FiveThirtyEight article points out, there’s not a strong historical relationship between the number of retirements and the number of seats flipped. 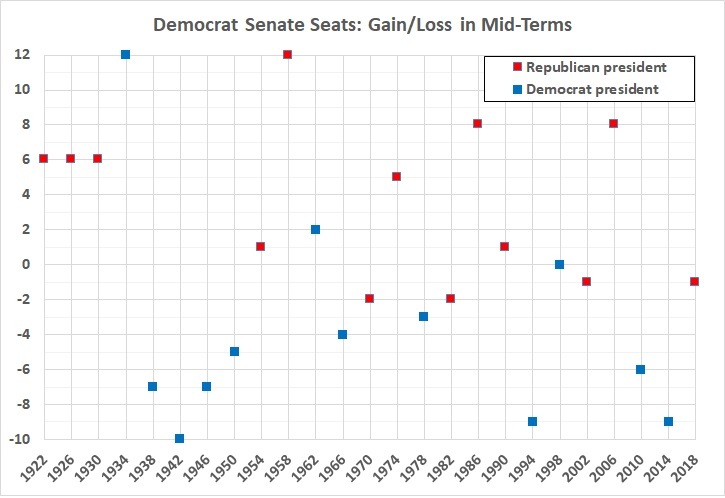 In 2006, for example, the GOP lost 30 seats, even though there were only 9 GOP retirees. FiveThirtyEight also points out that the GOP retirements generally occurred in more competitive districts, so it’s possible that most of the 8 seats would have been lost even if the GOP incumbents hadn’t retired.